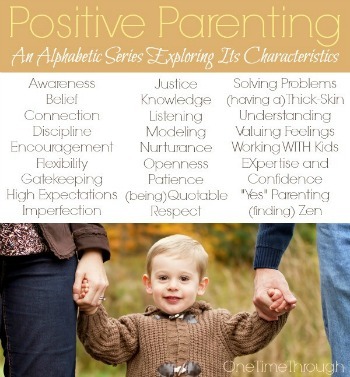 Welcome to the third week of our Positive Parenting blogging series! Today’s topic is Connection. It is probably one of the most important components of effective positive parenting – and sometimes can be one of the most difficult to do when time is crunched and moms and dads are tired. We will look at 5 things that are critical to establishing a deep connection with your kids as well as discuss some of the benefits of spending time on building that connection. Before we talk more about today’s topic, if you haven’t already, you might be interested in reading more about Positive Parenting – the approach that this series is based on. Connection. What am I referring to exactly? And why is it so important? What I’m writing about today is the basic NEED that every child has to deeply CONNECT with their caregivers on a DAILY basis, in order to feel safe, secure, happy and LOVED. If you are having difficulty getting your child to cooperate with you, or to listen, or maybe you are feeling like your child is angry with you, or even rejecting you, it’s likely that spending some time focusing on CONNECTING could make a positive difference to your relationship. So what can we do to ensure that our kids FEEL loved and connected to us? After reading my way around the positive parenting literature, and talking with lots of other parents, and a few professional parent educators, I have come up with a list of things we can do that I refer to as connection enhancers! This one can be really tough when you’re working all day and then rushing to get dinner ready before getting the kids into bed at a reasonable time. It’s far too easy to get caught up in all the tasks of life, and miss out on having that quality connection time. Here’s good news for busy parents – according to Pam Leo, author of Connection Parenting: Parenting Through Connection Instead of Coercion, Through Love Instead of Fear, getting at least 10 minutes of daily deep connection time with you can make a positive difference to your kids and your relationship. That being said, some kids are still going to crave or need more than 10 minutes, but it’s a good place to start – keeping in mind, that the more connection time you can give your kids, the better. 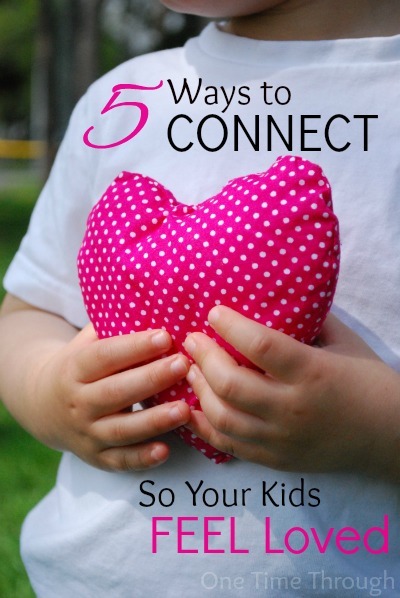 If you’re wondering what you can DO to connect in such a short amount of time, be sure to read: 30 Joyful Ways to Connect With Your Child in 10 Minutes. 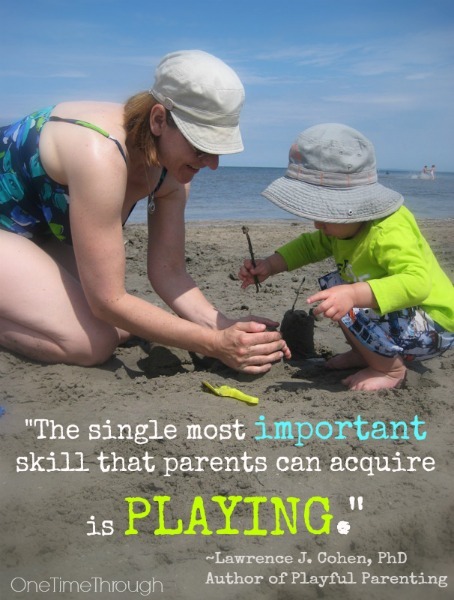 After reading Lawrence J. Cohen’s book Playful Parenting , I came to realize how important it is to PLAY with our kids at their level, following their lead, and without reservation. Taking the time to PLAY with your kids daily shows that you LOVE them more than anything else you can do or say. Play is the language of children – at any age. If you can meet your kids on their turf, so to speak, you are showing them that they are important to you. This may mean getting down on the floor and wrestling, or building lego structures together or having a tea party. It may mean joining them on the playground, or out in the snow, or kicking a ball around together. For older kids – it can be fishing together, walking together, going for a bike ride, going to see a movie/concert or sporting event together, or even just having a pillow fight! Even older kids still enjoy sitting down with a parent to read at night. Try taking turns reading chapters of a book. The idea is to let go of your inhibitions and just do it! If you’re doing it enough and with your full attention – you will soon be rewarded with smiles, laughter, eye contact, and spontaneous shows of affection. All signs of deep connection. Definitely worth it! 3. Give Kids Undivided Attention and Lots of It! Speaking of full attention, this one is a biggie. When we are with our kids, especially if we’re consciously trying to connect and show them we love them, it’s important to give them our undivided attention. That may mean putting the cell phone away or even turning it off for a bit. It may mean turning the background TV off and/or putting the iPad or computer away for a bit. According to the COPE parent ed program, this is what undivided attention looks like: your body is turned towards your child, you get down on their level if they are small, and you are looking at your child. I know that sounds really obvious, but I often have to remind myself of these. I find it helps to remember that attention is a basic NEED. Kids don’t “spoil” from getting too much attention, usually they spoil from not getting enough. The more they get, the happier and more independent they will be, knowing that they are secure in your love. Now that being said – it’s not healthy to give your kids attention at the expense of taking care of yourself either, or the kids will learn they are more important than others. It’s all about finding balance. It’s also worth noting that kids will find a way to get this need MET if they’re not getting enough. Sometimes…if positive behaviours don’t get them enough attention, kids try negative behaviours to get it. And so enters whining, interrupting, clinging, and other acting-out behaviours. These are both really complex parenting skills that deserve their own posts. That’s why I’ll be writing about them both later in this series. However, for now, it’s important to realize that kids need to be heard and validated as much as we adults do. When they scrape their knee, or a toy gets broken, or they have a bad day at school, they are experiencing the same feelings that we get when we have a migraine, the car breaks down, or our bosses are unhappy with us. For me, the book How to Talk So Kids Will Listen & Listen So Kids Will Talk , was a huge help in this area. It wasn’t until I read it and took a course based on the book, that I realized that many of the things I was saying to my son, that I thought were helpful, (“Oh your knee is not so bad!” or “Don’t worry – we can fix that toy.” or “Tomorrow will be a better day at school.”) were actually blocking our connection and in all likelihood making him feel unheard. Bonus: this book is great for helping you communicate with your spouse too! 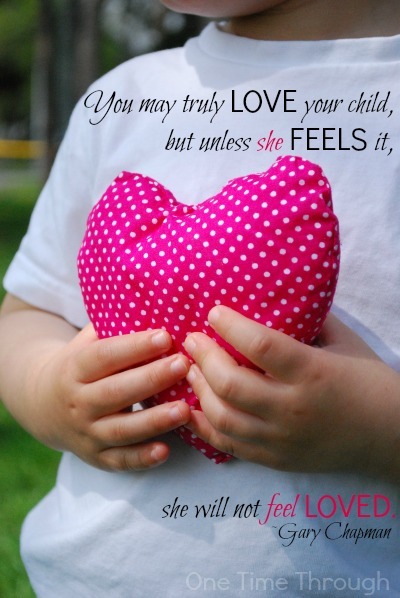 Kids need physical touch to feel loved and connected. It’s true when they are infants, and it remains true even as they get older. To read a fascinating summary of some research into the importance of touch including why touch helps our kids learn to regulate their emotions, visit this article by a psychology professor at The University of California, Berkeley. Beyond the basics of daily hugs and kisses, try getting more physical touch in with tickle games (if your child likes them), wrestling and roughhousing (shown to make kids smarter, more resilient, and socially intelligent – don’t believe me? Read this! ), piggy back rides, sitting together while reading, shoulder rubs, and holding hands. 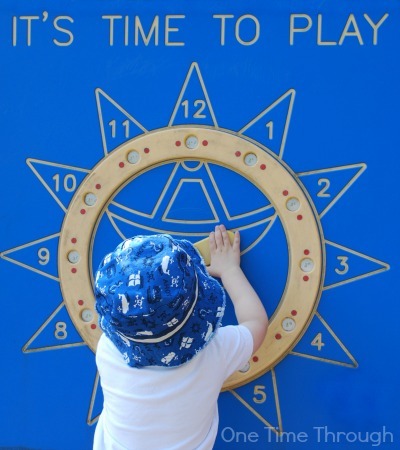 Find other fun physical games you can play with your child listed in the post: 30 Joyful Ways to Connect in 10 Minutes. 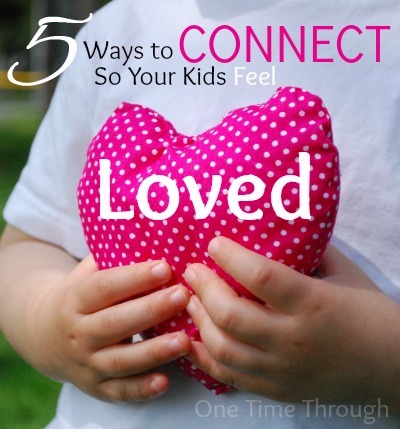 That’s it for 5 Ways to Connect So Your Kids FEEL Loved. I hope you’ve enjoyed reading about this important component of the parent-child relationship and found some useful ideas and resources to help you build a deeper connection with your child or children. By the way, I just finished creating a really neat printable resource that I’m calling Parent & Child CONNECTION COUPONS. You can print these fun play idea “coupons” off and use them with your child/children in a variety of ways to help stimulate fun connect time. Your kids will LOVE these! To find even more fun and educational activities as well as positive parenting tips, follow me on Facebook or Twitter. It must be because we are both teachers turned Mamas! I am very new to blogging (but have been snapping pictures of projects, activities and birthday parties for years), but love your site because it is just what I am working toward as well! You have tons of great resources that I can’t wait to check it. Looking forward to joining you on this journey! Glad you dropped by and found us Shannon. Your site looks wonderful!